The holiday season wouldn’t be complete without a little holiday baking. However, we all know that traditional holiday baked goods are the enemy of a lean physique, as most are high in sugar and fat and low in fiber. Not exactly a recipe for success. 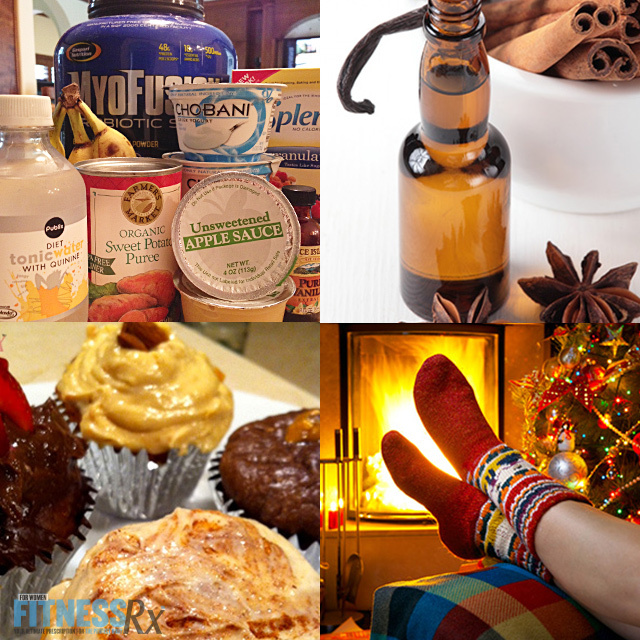 But, rather than simply giving up on goodies this holiday season, try these clean ingredient swaps and suggestions to slim down your holiday favorites. Happy baking! Prunes or Dates* – Best with chocolate-based recipes. Mashed Banana – The banana flavor will be evident in the final product. Best with banana bread, coffee cakes and muffins. Unsweetened Applesauce – Works well in almost any baked good. However, it can lighten the color of some chocolate desserts. Beans* – Try cannellini and black beans. Works very well with brownies. Sweet Potato or Pumpkin – Canned versions without sugar are available, making these items an easy swap. BEST RESULT: To keep the taste and texture close to the original, use a fruit or vegetable puree for a quarter to half of the required butter, shortening or oil. For example, if your recipe calls for 1 cup of butter, use ½ cup of butter with ½ cup of fruit or vegetable puree. TIP: May need to reduce the baking time by up to 25%. *To make a puree of these items, place the fruit or vegetable in a food processor with a little water and pulse until smooth. Add 1 tablespoon of water at a time. Less is Best. You can decrease the amount of sugar called for in a recipe by 1/3 and not miss it one bit. In some cases, I’ve been able to get away with a 50% reduction. Sugar Substitutes. Splenda Granulated, Truvia Baking Blend and xylitol can be used in place of sugar. Follow the directions on the package to ensure you substitute correctly. For example, you need only ½ cup of Truvia to equal 1 cup of regular sugar. Extra Extracts. Adding cinnamon, almond and vanilla extract to your recipe can give the illusion of sweetness without additional sugar. Fluff it Up. Using less sugar and fat substitutes can sometimes make your baked goods a little dense. To help keep your creations light and airy, use carbonated water in place of regular water. Ice it Right. Try icing your cakes and cupcakes with Cool Whip and fresh berries, a little powdered sugar or Greek yogurt mixed with protein powder. TIP: I’ve had a lot of success with Gaspari Nutrition’s Myofusion Pro protein mixed with plain, fat-free Chobani Greek yogurt as an icing. To make it, mix 1 scoop of protein for every 6-ounces of yogurt. (Add more protein for a thicker icing.) Place in the fridge for about 10 minutes to allow the icing to set and thicken before you spread it onto your cake. I love my holiday morning ritual. I sit by the warm glow of my Christmas tree, read, journal and sip my coffee before I start cardio. These quiet moments allow me to reflect, set my intentions for the day and establish a peaceful mindset. If you’re feeling a little frazzled and stressed this holiday season, you can help transform your mindset by waking up just 15 minutes earlier to meditate, pray, read, reflect and/or journal. It’s one of the best gifts you can give yourself this holiday season. Keep pushing— your best is waiting.